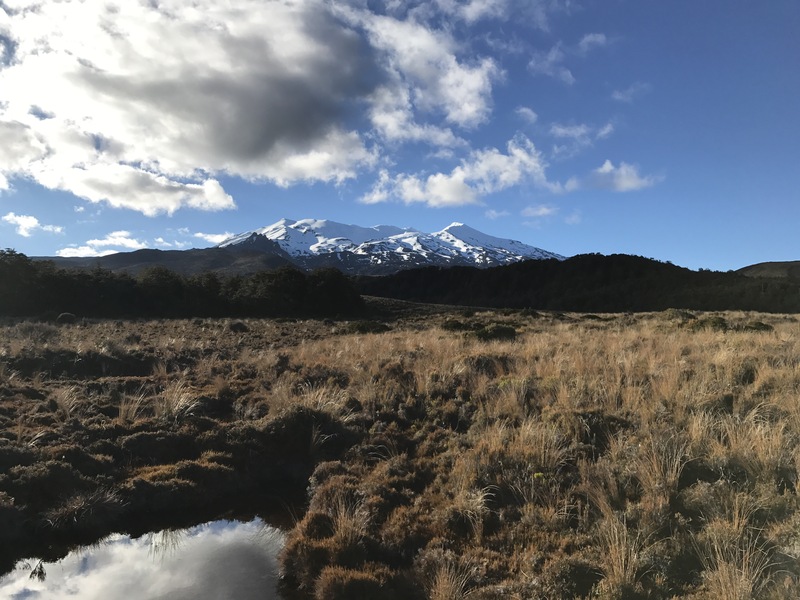 We woke up today in the alpine village of Whakapapa at 6 – it was a fresh, cold, snappy morning but we had stayed the night in a holiday park so we all headed to the warm and steamy kitchen as soon as possible. Knowing we only had 15 or 16 k of actual walking to do throughout the day (we planned to hitch about 5 k of highway at the end of the day) we dawdled a little over our One Square Meal bars before mustering the courage to head back outside. Sometimes it feels strange and unlike thru-hiking how much we have slept in commercial campgrounds so far this trip. And of course, as we began the trek out of town we passed a couple of secluded patches of grass that probably no one would have hassled us if we had set up our tents on. Turning off the town road and into the track the would take us towards the town of National Park, we immediately entered the most beautiful alpine forest – shortish gnarled spruce trees (not sure if actually spruce) covered in lichen surrounded us and the walking was so flat and smooth compared to what we have been tramping on. 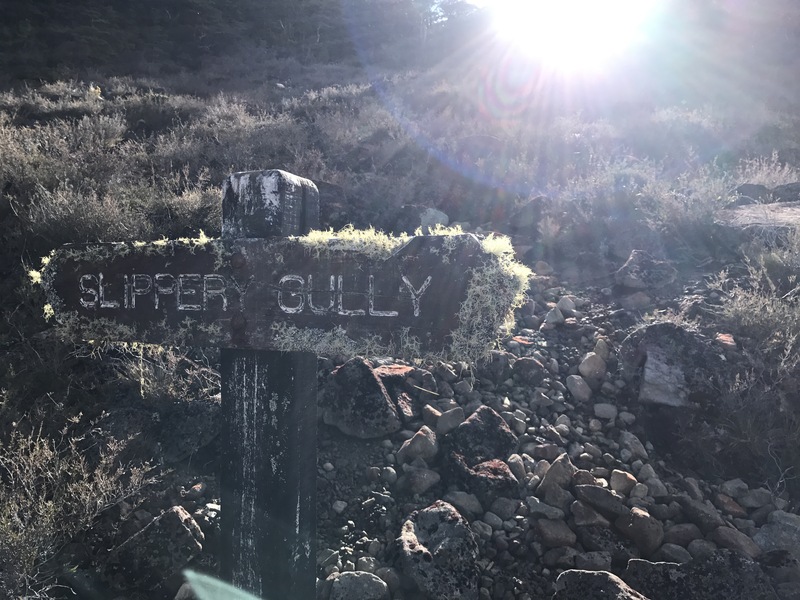 A couple rushing rocky rivers and gullies bathed in early morning sunlight and I think we had all individually exclaimed about the beauty of this track. The notes do not prepare you for this track; personally by this time I had tacked this walk up on top of my favorites list of this trip so far. 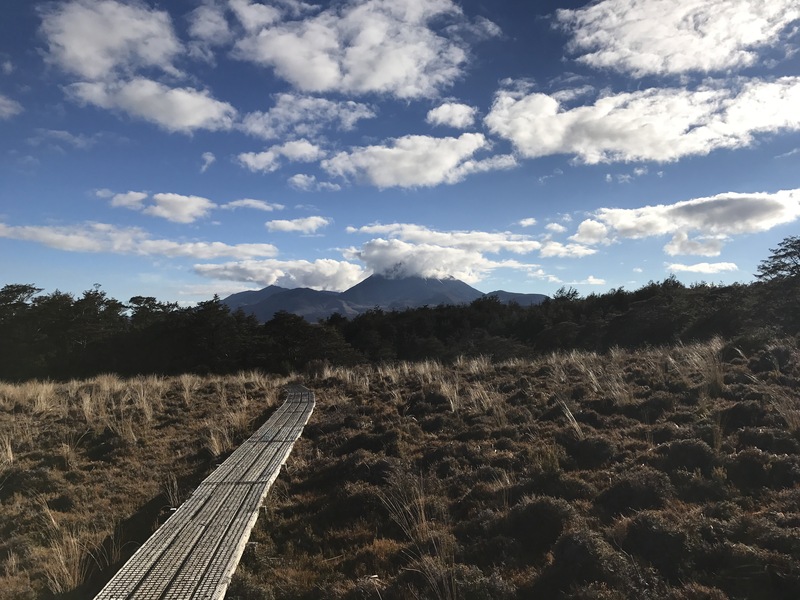 And not but a couple kms into the track we broke out of the forest into some scrubland, and there was Ruapehu towering above us to our left in all her glowing morning beauty! 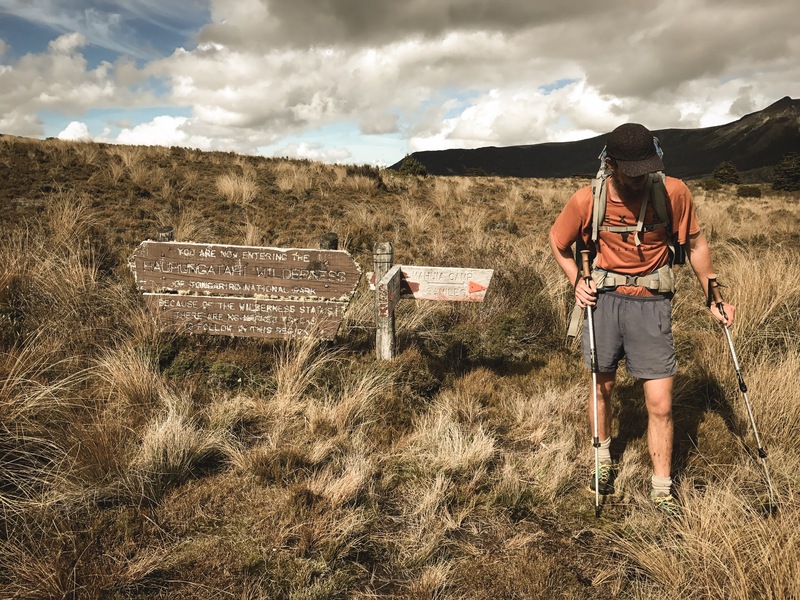 The boardwalk under our feet was welcome as we traversed the marshy red-orange tussocks and clambered in and out of river valleys but about 8 k in, at a track junction with the track to a nearby hut, we turned right and the boardwalk was no more. The rest of the walk, The Hauhungatahi Wilderness Track, was unfortunately some marshy muddy rutted track and although it was through alpine scrub the mountain was now at our backs, so after getting past a boulder-hoppable river crossing and breaking for ten or fifteen minutes (we weren’t feeling our most efficient thru-hiking machine selves that we were a mere two days ago on our 40 k day) we put our heads down and charged through the last 5 k to campsite and highway. All in all, despite some less than ideal track conditions, yes, the notes really undersold this morning’s walk and I do think it was one of my favorite stretches yet. We eventually got a hitch from a local kayaker into town after splitting up and walking about 3 km, and we went right to the YHA and booked a couple tent sites. 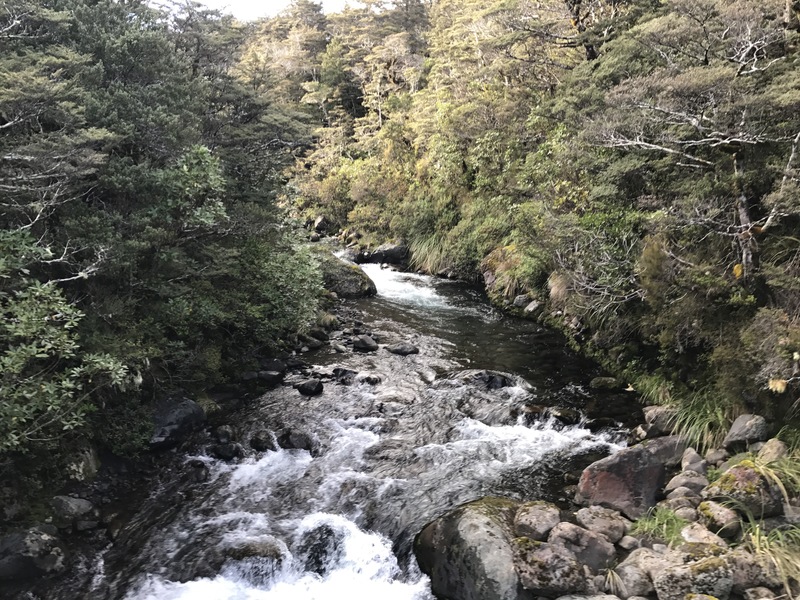 Soon after setting up camp we drove down to Ohakune with our canoe company where we would meet with these canoe people and discuss our plans for the upcoming Whanganui River section. Gavin of Yeti Tours gave us the scoop and we decided to change our plans a little bit instead of walking two days to approach the river and putting in at Whakahoro, we are going to start from Taumarunui, which will add 2 days onto the trip (making it 8 days) and require a shuttle from National Park to Taumarunui, but the guys at Yeti will drive us there free of charge and the extra days add no cost to the rental! 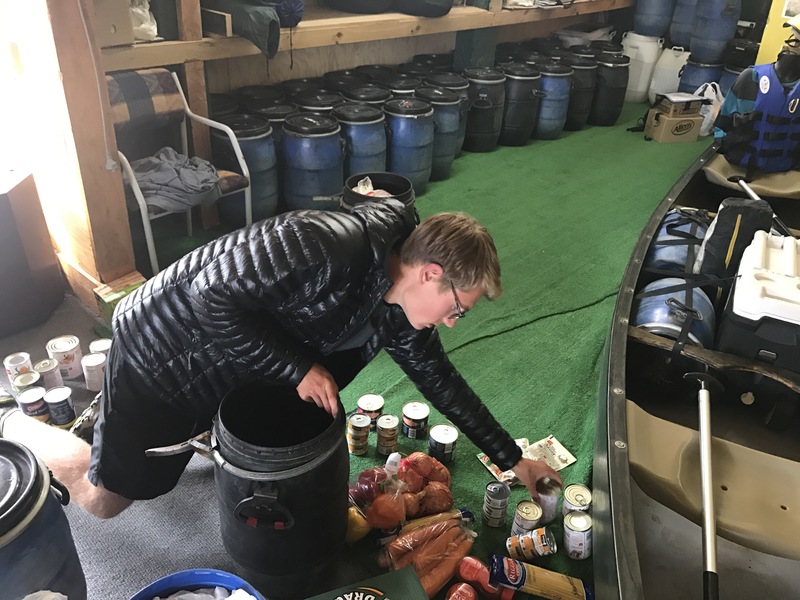 We then went to the New World to buy all the food that our hearts desire to throw in the canoes, and packed our barrels and Paul drove us all the way back to the YHA. 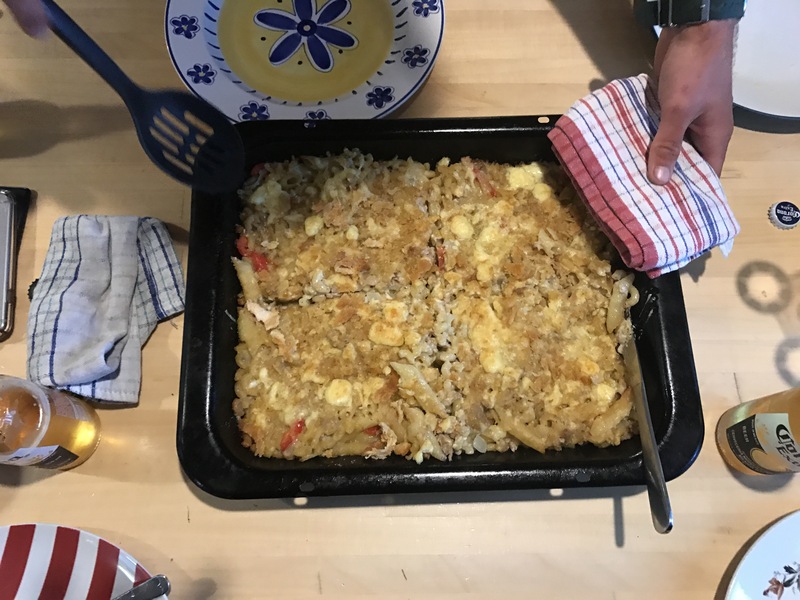 After decompressing for the afternoon we gathered our energy to make some tuna macaroni and cheese casserole with fresh produce – and as we finished Shep brought out from the fridge a huge glass dish of pink rice krispies treats. 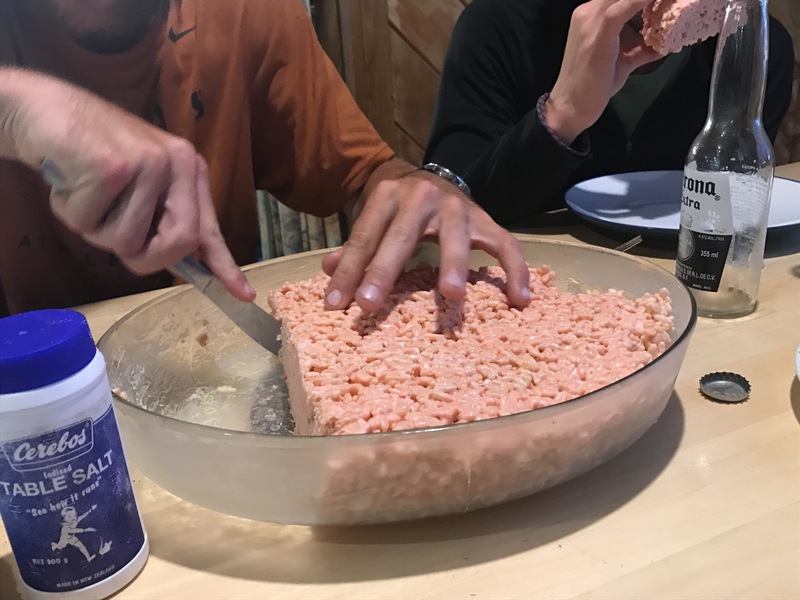 We offered some to the curious French people sitting further down our table and they were most surprised by this baffling American concoction. As Shep and Jack returned to the tents under some suddenly roiling black skies Jasper and I retreated to the TV lounge room and are fully reclined on couches, updating the blog amid groans of fullness and tiredness. Ta ta for 8 days; we leave tomorrow morning at 8:30! 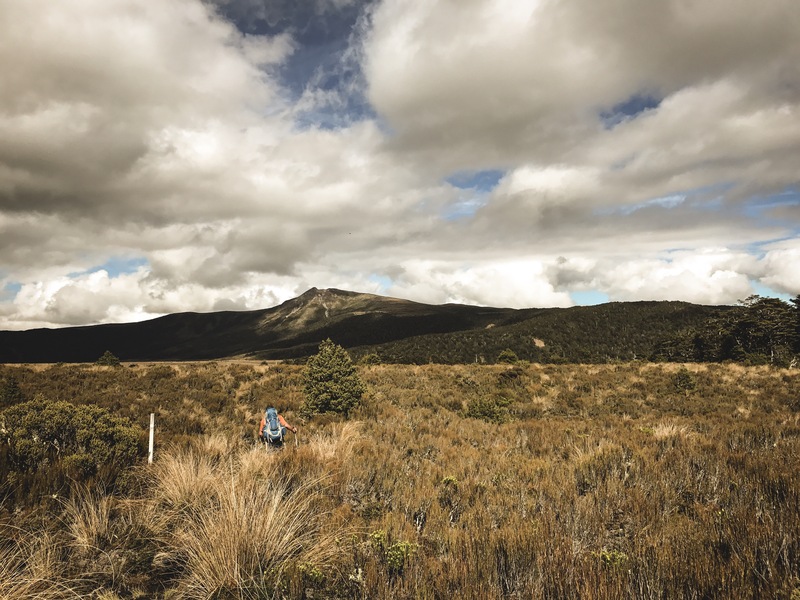 Did you travel down Fishers Trail, the Retaruke Valley to Whakahoro? I’d love to see some of your photos. We actually decided to head back up to Taumarunui to start the river from there. So we didn’t do Fishers, but gained two river days instead.